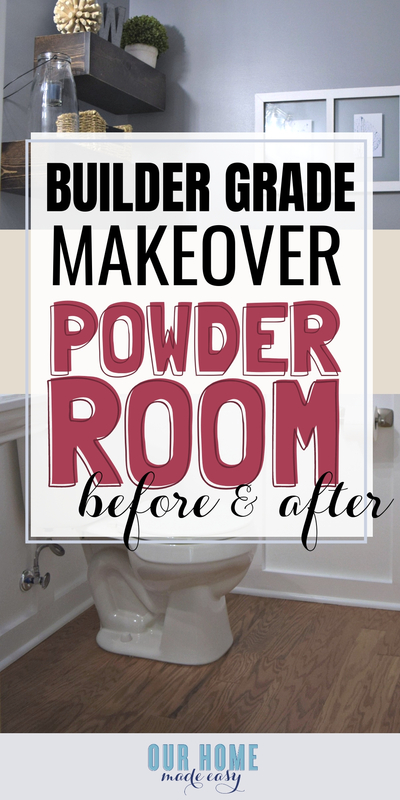 Here is an easy DIY budget powder room makeover! We used easy projects to go from builder grade blah to modern style with simple & easy projects. AHHHHHH!!!! It’s finally here! Can you believe it has been one whole month since the One Room Challenge started? Everything happened so quickly. 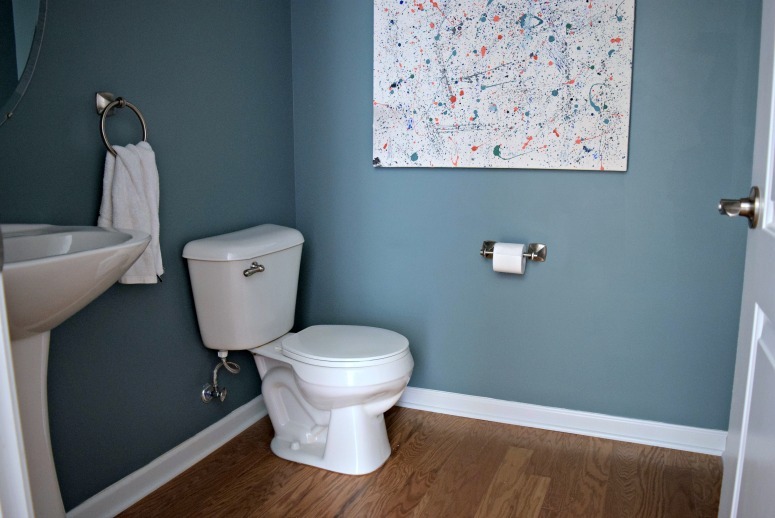 I cannot wait to show you the powder room finally finished. And you, guys our marriage is still a thing, so we survived 🙂 This was such a fun challenge, but gosh, it was work. With only having the weekends to do projects (and add in a holiday), we were constantly pressed for time. If you’ve never stopped by this corner of the internet, I’m Brittany. 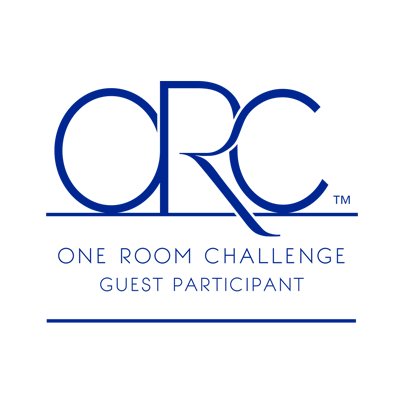 I am super passionate about sharing easy and quick tutorials. I love creating simple projects that any busy mom can actually create— even if she doesn’t have a lot of free time. 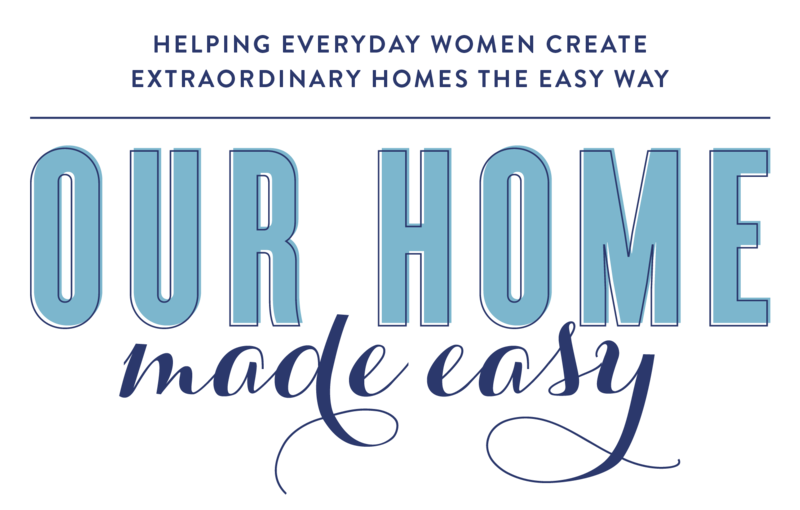 The One Room Challenge is sponsored by Linda at Calling it Home. 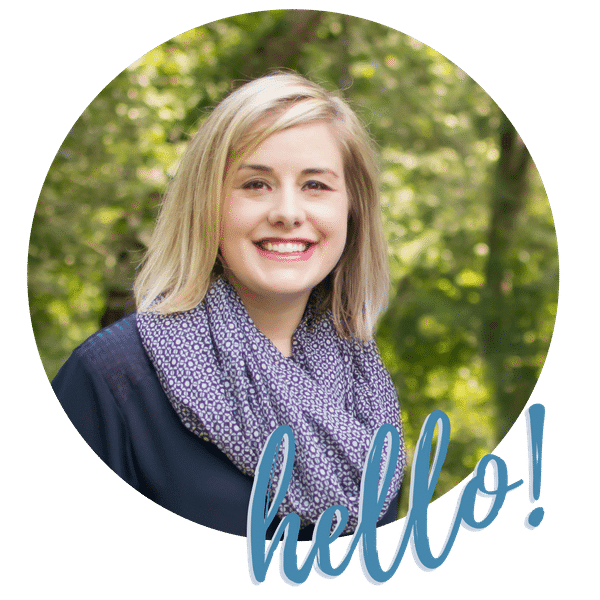 Each week you can see the guest blogger’s latest updates at Calling it Home. It’s a great opportunity to see so many design styles, find potential DIY projects for your own home, and finally — a finished room! Don’t forget this was only 5 weeks ago! And here was the design plan! I am really proud that I stayed as close as possible to our plan. We are super visual people, so it was helpful to take the time, pick out the pieces individually, and then place them on a board. And here is the Powder Room looking a little bit fancier these days…. drumroll please! Wandering what we accomplished over the past month? Doesn’t it look awesome? I am so proud of the work Jordan did on this room. I tried to help out as much as I could shopping ( 😉 ) and setting up & tearing down the room as he worked. 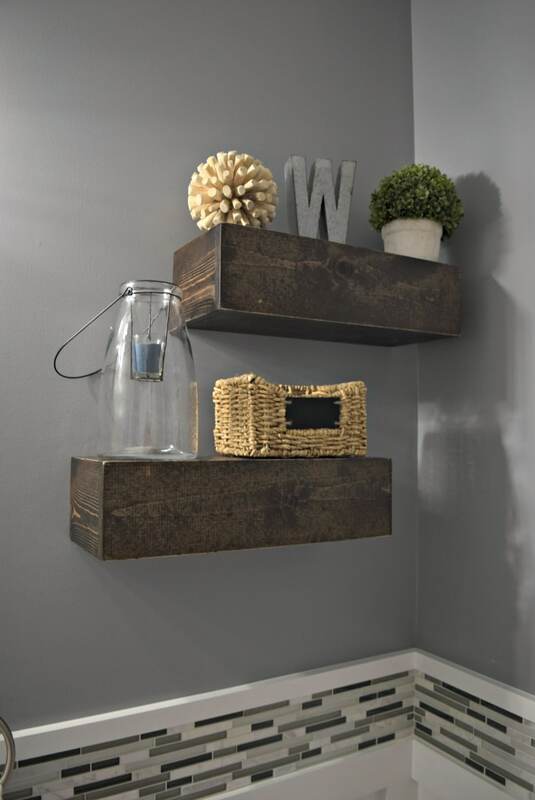 I love how the floating shelves are fun to look at it and give me a spot to store away extra items for visitors. Bonus– can you believe I picked up that glass lantern for less than $10? It was my deal of the day! Every item on the shelf was less than $10 apiece. At Home Goods, I picked up most of the decor, including the basket, which was only $4.99! It’s turned into my favorite space. Even Aubrey told Jordan that she loves it. 🙂 Whew. After this crazy busy makeover, it’s time to give Jordan (and our wallet) some much-needed rest! The new powder room is beautiful . I can’t believe you had that large of a transformation in only 5 weeks. Wow!!! The new powder room looks amazing! 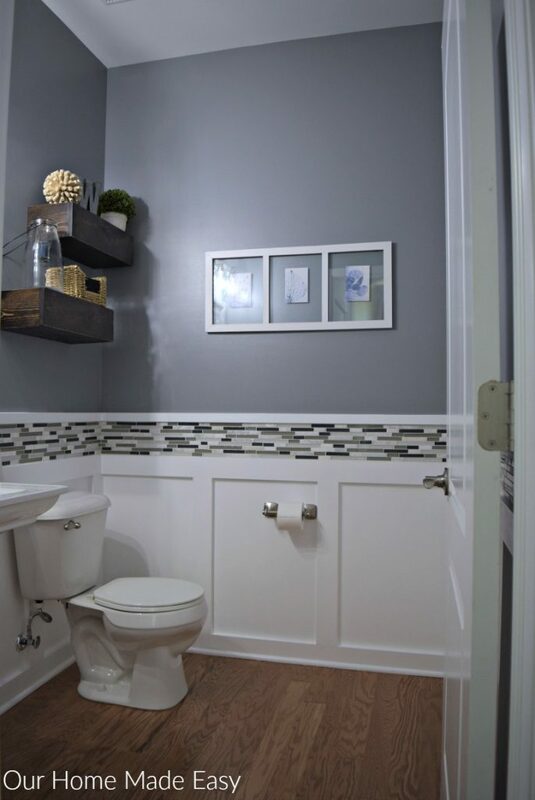 You did a great job with that board and batten and the tiling. I love how it all came together. 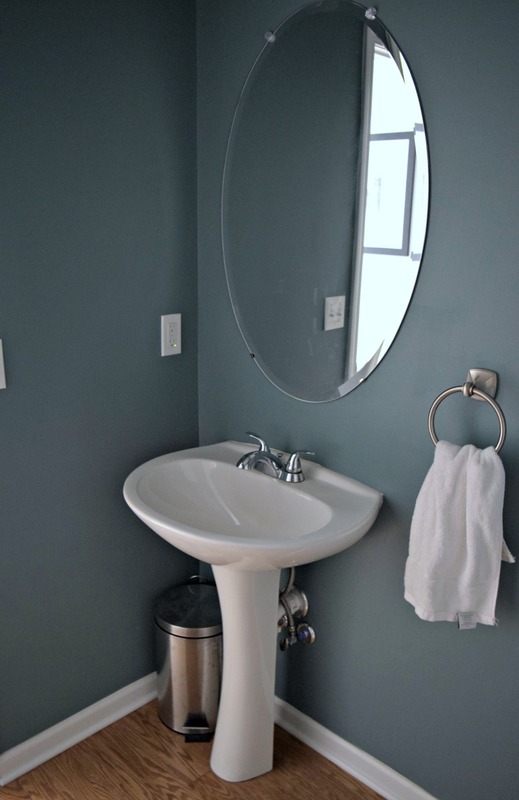 Also, I’m loving the geometric-ness of that pedestal sink! It looks so good with the walls. Also good job for finishing in the allotted time, the ORC can be totally crazy. You did it! That’s an awesome transformation. I love the paneling and also the floating shelves in particular. The room looks very cohesive! This is awesome! It looks great! 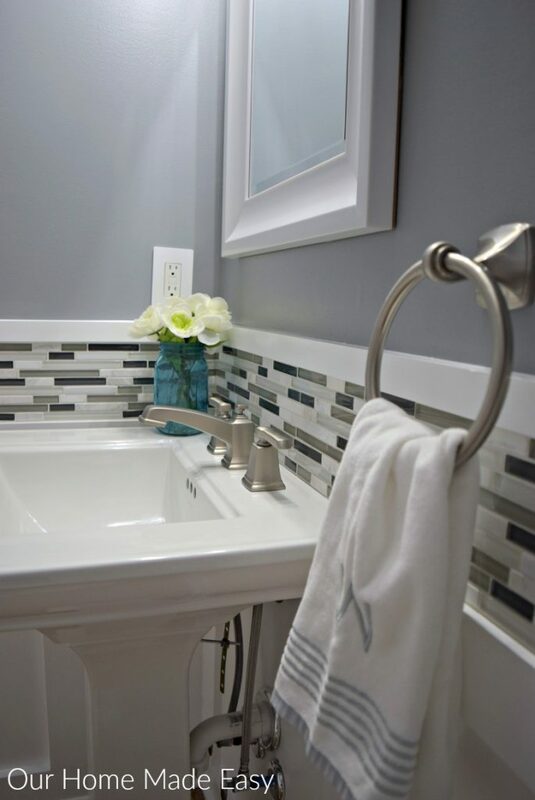 Love the colours,the mosaice tile… beautiful! Good job! Looks great! 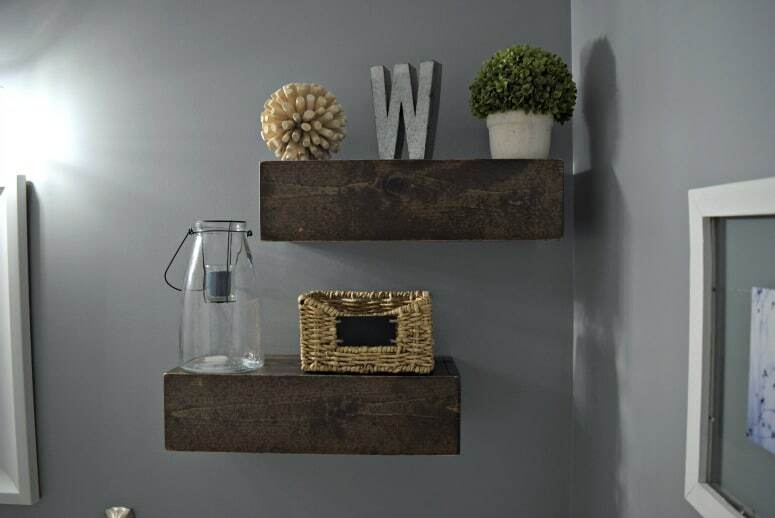 I love the light fixture and shelves. Congrats on finishing the ORC! Looks great! I love board and batten, and that light fixture is fantastic! Love this look. 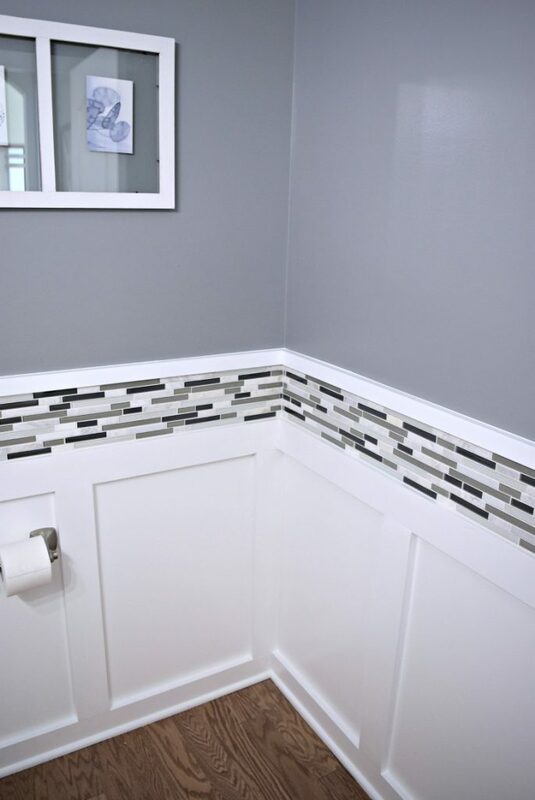 Do you think I could use the stick & peel tile for a small powder room? 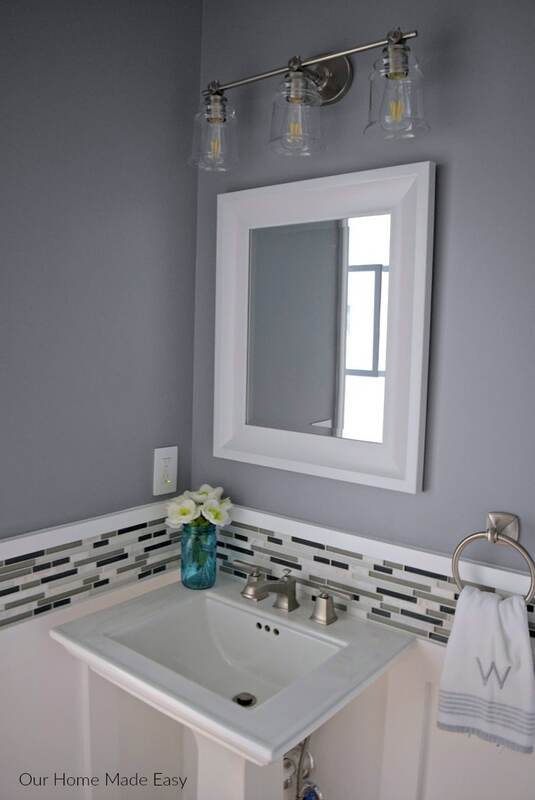 I am so in love with your transformation the brilliant colors caught my eyes… I really need that mirror for my guess bathroom can u tell me where did you purchase it. Keep up the good work!! I really like your makeover and am thinking of doing ours similar. Thank you for including the sources and names of paints etc. What was your initial budget and what was the final cost? Hi Jamie! Offhand I don’t recall the total cost. The paint and Board & Batten made such a big impact for a relatively low cost. The supplies needed would depend on the size of your bathroom. For each paint color, we bought a gallon of paint. In the board & batten post, I think I mentioned how many boards we used. For the shelving, we made those ourselves for less than $10 a piece. 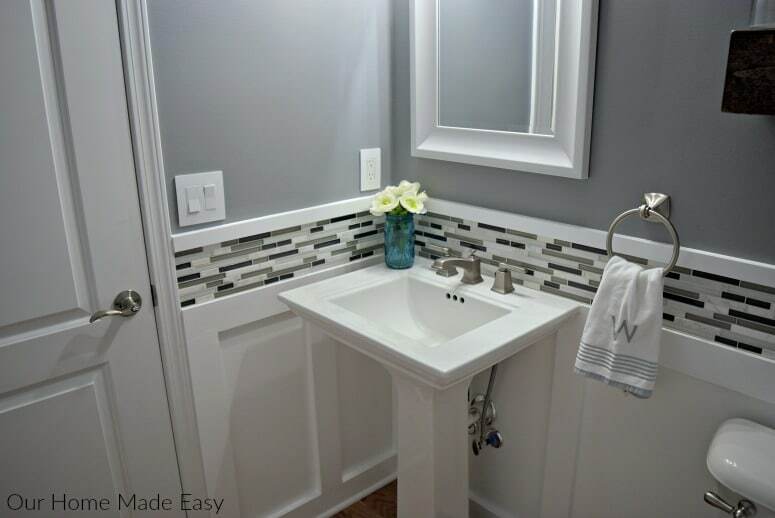 The largest cost was the new pedestal sink. But that was a splurge and totally NOT necessary. 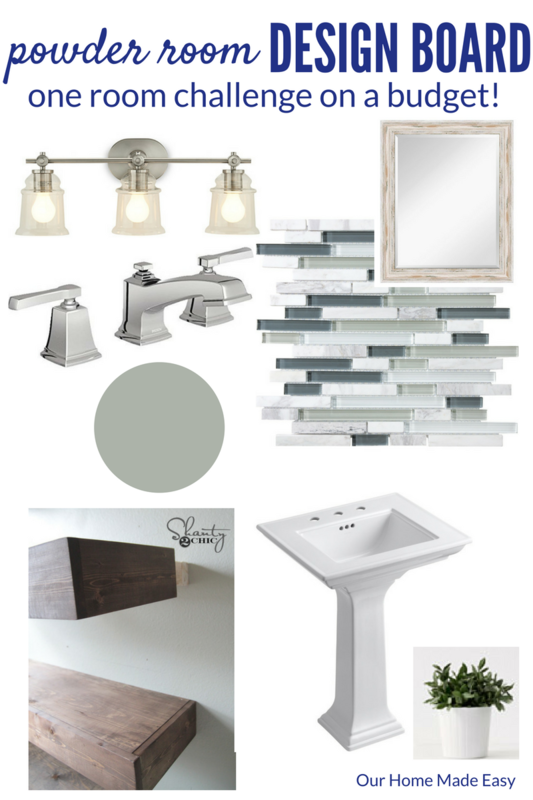 Thank you for stopping by and good luck on your bathroom project!